I’m suffering summer heat now. I have to get more energy ! This is not a time for eating fishes ! Meat. Meat, Meat !!! 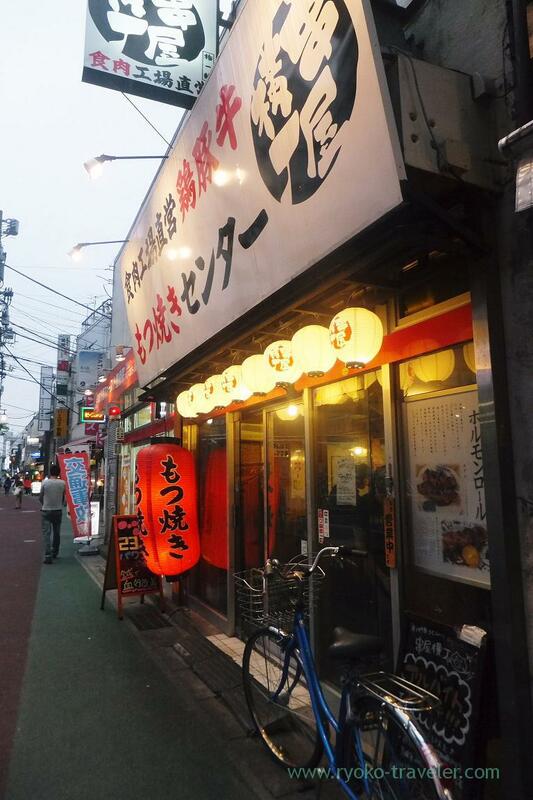 This is the izakaya that I had wanted to visit for a long time. This shop serves high quality innards of pig, chicken and beef at lower price because they run meat processing factory. Motsuyaki means grilled innards in Japanese. There are many branches of this company around Metropolitan area. We ordered drinks at first. 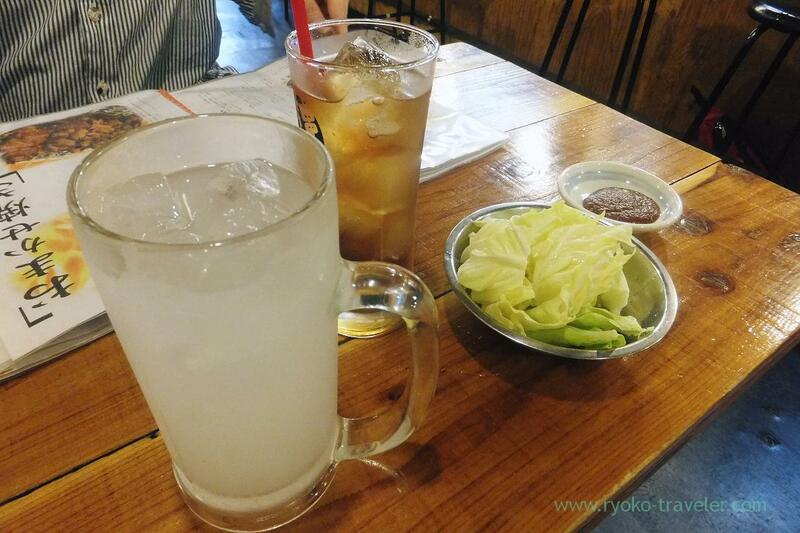 Then, our drinks were served with otoshi. My drink was White sour(白いサワー, 390 yen). 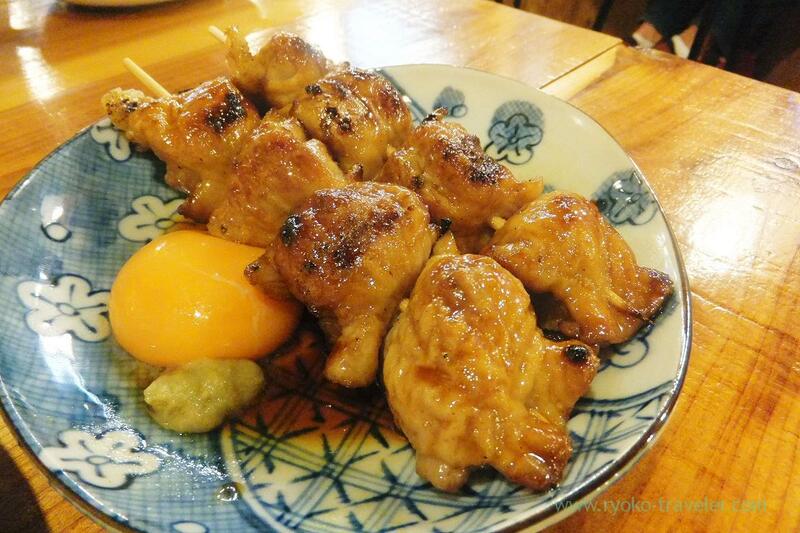 Cabbage is standard otoshi for inexpensive izakaya that serve fatty foods mainly. We can eat much cabbage as we like here, too. 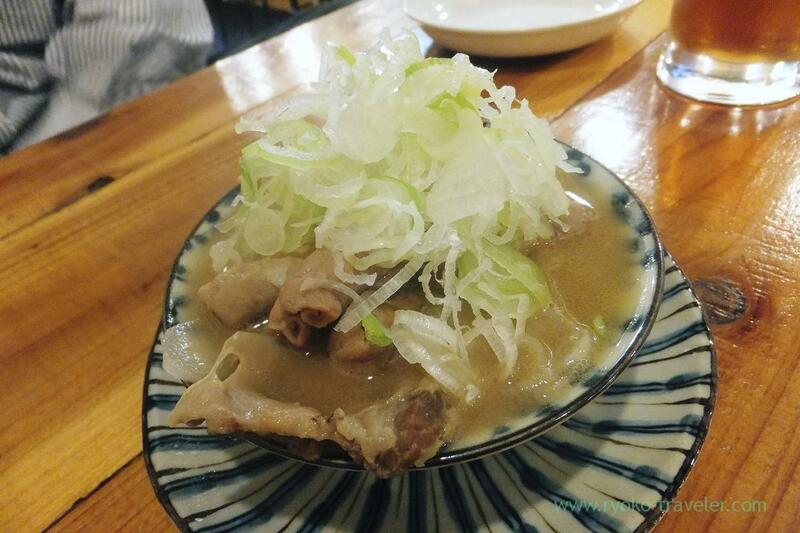 Stewed innards(煮込み, 330 yen). As you see from this photo, it was rather lighter tastes. 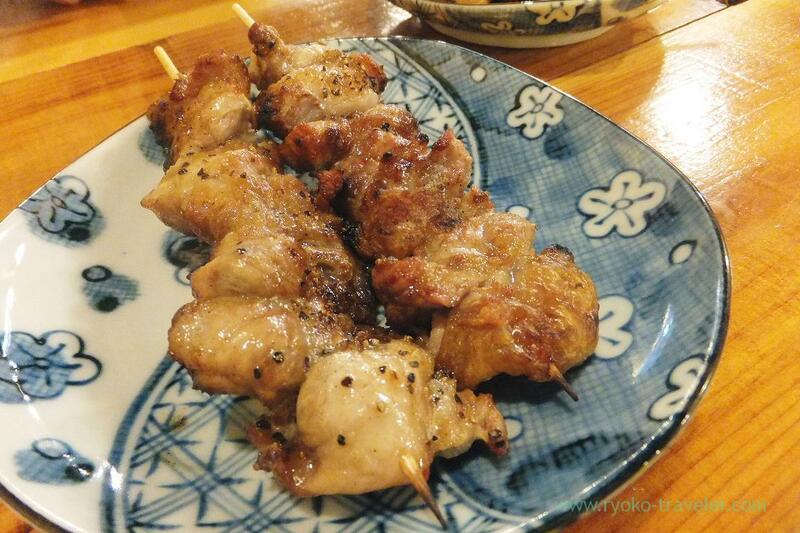 “Yoton” means pig breeding in Japanese and “Bakuniku” is … umm… great meat ? Maybe they want to show it’s great meat anyway. Certainly it was rather juicy and chewy. I like it. 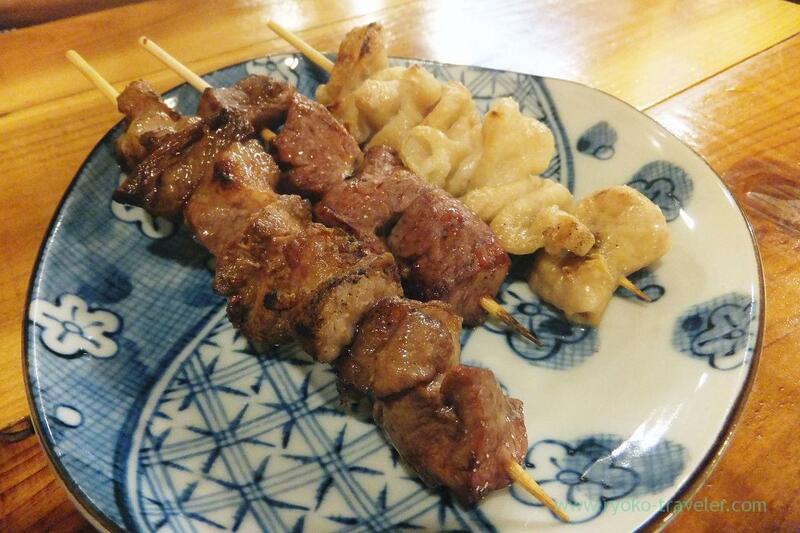 Chef’s choice of yakiton 3 pieces (おまかせ焼きとん３本, 300 yen). Pig’s liver, heart and small intestine. This shop’s specialty ! Super horumon roll (スーパーホルモンロール, 120 yen) ! Those were fat itself ! But delicious ! But fat attacked me ! 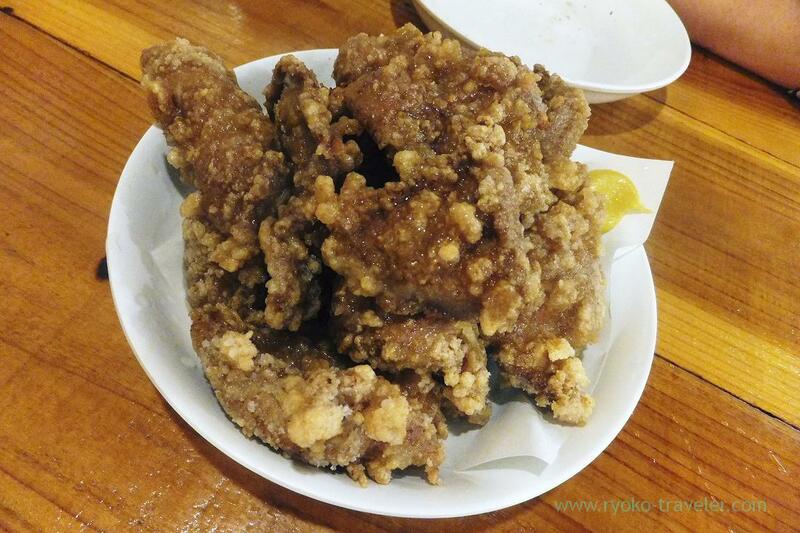 Those deep fried liver were dressed with plenty of vinegar. So, it was sour, but tasty. Thanks to the vinegar, there was no bad smells and the livers were soft. I know there’s a lady who eat it up by herself. But certainly it was delicious enough to eat it up. I love motsuyaki! Ah I wish I was in Japan right now so I could eat some. I wish you visit Japan in the near future and eat some.